The Genealogy of Jeanie's Family better know as Jeanieology: Book Reviews: History: Whatever Strikes My Fancy! As I wrote in my post on Adam Winthrop, Sr., I am excited to have the Winthrop name in my family tree. 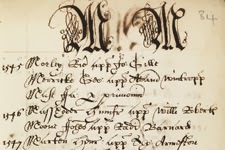 Although I am not directly related to John Winthrop, I am related to his grandfather Adam Jr. Adam lived in a interesting and dangerous time in English history, smack dab in the midst of the Tudor Dynasty, and decisions he made during his lifetime made a lasting impact on his children and grandchildren's future. Adam was born to Adam Winthrop Sr. and his wife Jane Burton in October of 1498. The future Henry VIII was a boy of seven and the country, under the leadership of his father, Henry VII, was recovering from decades of war, both civil and with multiple European countries. The manufacture and export of English cloth was reaching the height of it's boom and wool and cloth merchants were amongst the richest men in the country. 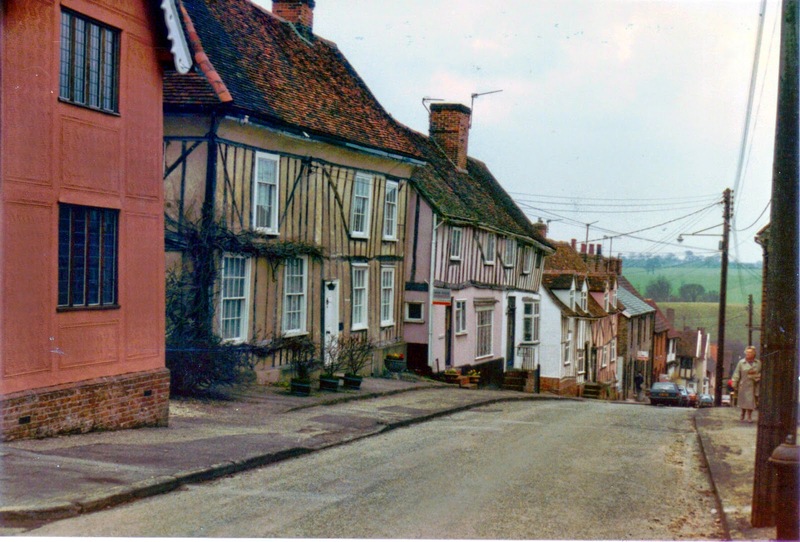 Lavenham, a market town in the county of Suffolk was at the heart of the cloth business. Adam Sr. was described as a cloth merchant. His background is unknown. He had his son, Adam Jr., baptized at the magnificent church of St. Peter and St. Paul in Lavenham, which was undergoing a major face lift courtesy of the rich wool merchants. Adam Sr. died at some point in young Adam's life and his mother remarried to a wealthy cloth merchant, John Ponder. John Ponder saw to the future of his stepson Adam by apprenticing him to a powerful member of the Fuller's Company of London, his name was Edward Altham. 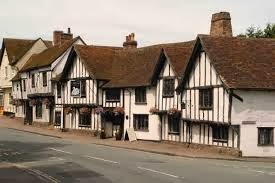 In the year 1515, Lavenham was a pretty happening place as far as market towns go. The population was about 1,100. I wonder what Adam thought the first time he laid eyes on London. Teeming with people, (about 200,000) animals, and with sights, sounds and smells unlike anything he had ever seen, it must have been amazing. Along with the hard work of apprenticeship and for a while a bit of homesickness, there was the pageantry of the church and the guilds, the theater of life outside his window, it must have been an exciting time in young Adam's life. His apprenticeship with Altham was a long one, about 11 years. He finished in the year 1526. In October of that year he went to the Fullers Hall in Fenchurch St. and swore his oath, becoming a member of the company. Meanwhile, the King had begun his affair with Anne Boleyn and his break with Rome, he and his unsuspecting subjects were barreling towards a future none could have predicted. As a member of the Fullers Company, Adam was able to go the Guildhall of London where he took his oath as a freeman and was enrolled as a citizen of the city. Freedom of the city brought the right to vote in parliamentary and city elections as well as other rights and privileges. What he needed next was a wife, and he choose, of all the girls in London, Alice Hunne, daughter of Richard Hunne who was murdered in the Lollard Tower of St. Paul's Cathedral in 1514. I think that said a lot about Adam's religious beliefs. Adam and Alice were married 16 November 1527. Alice's first child, a son they named Thomas, died at six months of age. Her second child was William. He was born in November of 1529. She would give birth to and bury three more children, dying herself in 1533. William Winthrop her only surviving child was my ancestor. In 1531 Adam took on his first apprentice, a sure sign he was advancing. He went from journeyman to householder to a full member of the Liverymen. His relationship with Edward Altham surely advanced his career. The Fuller's Company had merged with the Shearman to form the more powerful Cloth Workers Guild and in 1537 Altham was made Guild Master. By 1541 Adam lived in the parish of St. Peter's Cornhill, he was the third wealthiest man in his neighborhood that year. King Henry VIII was by 1541 married to his fifth wife, his break from Rome complete. He still considered himself a catholic, but changes to the church were coming fast and furious. In 1534 Adam married for the second time, his wife was Agnes Sharpe, daughter of Robert Sharp of Islington. They would have eight children between 1539 and 1550. One son, Adam, died as an infant. By 1544, Adam's oldest son, William, had joined him in the family business. With the dissolution of the monasteries came the opportunity to buy manors and land. 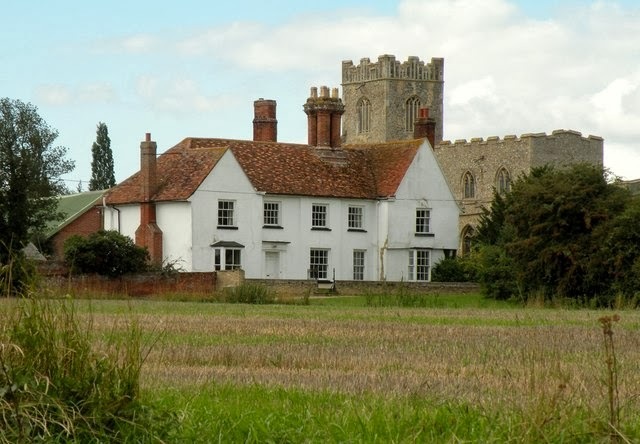 Adam bought the manor of Groton in Suffolk in 1544. In 1547 King Henry died and his protestant son, Edward was crowned. The Cloth Workers Guild had decidedly protestant leanings and as a Church Warden at St. Peter, Cornhill, Adam assisted with the transformation of both the physical and spiritual church. In 1552, John Pulleyne was made Rector of the church, he was strongly in favor of reform. In 1548 Adams was granted his coat of arms and entered the lowest order of the gentry, gentleman. Now, I hate to disappoint you ancestry.com peep who have "Sir" and and "Lady" before Adam and Agnes' names but those titles are incorrect. Adam was Mr. Adam Winthrop. And he certainly was not a Viscount as several ancestry members claim. Not only did Adam have a thriving business but he was gaining prominent positions in the Guild. Adam at one time owned one ship and had 3/4 ownership in a second. 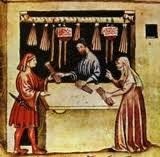 With these ships he was able to export his cloth as well as good for other merchants. Adam held various positions in the Guild itself, up to and including Guild Master in 1551. The events of the year 1553 would change all that. King Edward, never well, died in 1553. A brief attempt to put protestant Lady Jane Grey on the throne ended with her violent death at the hands of an executioner. Edward's sister Mary, with help of her catholic supporters attained the throne and brought the protestant reformation to a screeching halt. Men, like Adam, who had made their preference for the protestant faith plain and clear, now found themselves in a precarious position. Adam decided to leave London and the business and retire to the country and his manor of Groton. Not much is known about the life of the Winthrops in Groton during the remainder of Adam's life. It must have been a huge change for his London born children to suddenly find themselves living in rural Suffolk. William, his oldest child, remained in London running the family business and working for changes in the church. Adam gave him the property in London. Adam and Agnes lived in Groton until his death in 1562. Agnes remarried the following year to William Mildmay of Springfield Barnes, Essex. Groton was left to Adam's oldest son with Agnes, John. This would cause a lot of problems for Adam III, the father of John Winthrop. Adam wrote his rather lengthy will in September of 1562, he named his wife and children John, William, Adam, and four of his daughters, Alice, Bridget, Susan and Mary. Adam was buried at the church of St. Bartholomew in Groton. His tomb was restored by by his ancestors. His legacy was carried forward by his grandson John who was the first Governor of the Colony of Massachusetts. I am descended through his son William and his daughter Elizabeth Winthrop Munning. Although she did not see John's 'Shining City on a Hill' her daughter did. Most of my information came for the excellent biography of John Winthrop by Francis J. Bremer, click on the link to see book. Not many people can claim to have a martyr in their family, and by martyr I mean the honest to God type that died for their religious beliefs, not your long suffering relative who had to put up with their (fill in the blank) family members. I was actually shocked when I found about this man, Richard Hunne, and his connection to my family. England in 1500 was still a firmly catholic nation. Martin Luther would not post his manifest until 1517, Henry the VIII was still a boy, he would be crowned in 1509, but would not make his break from Rome until the late 1520's. Still, there were the beginnings of dissent against the all powerful church. The Lollard movement has lost much of its steam after the execution of Sir John Oldcastle, but there were pockets of of dissatisfied believers who agitated quietly, and some not so quietly, for change. Each one risking their like for doing so. What follows is a convoluted but very interesting story which includes many prominent men of the Tudor time, including Henry VIII. Richard Hunne was a merchant tailor who lived on Bridge Street in the parish of St. Margaret in London. His date of birth is unknown, he was married and had had at least two children. A boy, named Stephen, was born in 1511. This boy was "put to nurse" to a woman named Mistress Agnes Snow in the parish of St. Mary of Matfelon in Whitechapel. The child, as did many at that time, did not survive. 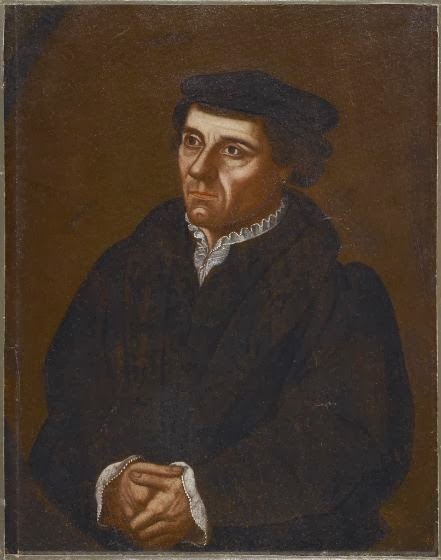 He was buried on 29 March 1511. Following the funeral the parish priest Thomas Dryffeld demanded payment for his services, asking for the christening gown in which the body of the child was wrapped. Richard refused. 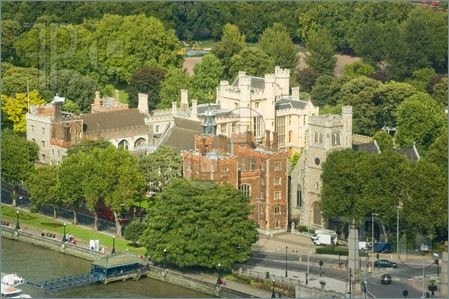 Over a year later Thomas Dryffeld, still tying to get his mortuary fees, cited Richard before the spiritual court at Lambeth Palace, the London home of the Archbishop of Canterbury. Richard received his summons on Wednesday April 28. He presented himself in court on 13 May, presiding over the court was Cuthbert Tunstall, auditor for the Auditor of Cases for the Archbishop. Dryffeld demanded that Richard be excommunicated in addition to paying his funeral fee. Tunstall found against Richard and ordered that he turn over the gown or pay it's equivalent value, he declined to excommunicate him. On 27 Dec 1512 Richard, along with friends and or associates, attended a service at St. Mary Matfelon. The Chaplain, Henry Marshall, who was officiating the service spotted Richard, stopped the service and spoke loudly to Richard Hunne saying " thou art accursed, and thou standest accursed. An go thou therefore out of the church." This would surely have been greatly embarrassing for Richard and would lead his associates to believe that he had been excommunicated, making him a pariah. Richard brought a charge of slander against Marshall before the Kings Bench on 25 January 1513. The immediate result seemed to have been a bit of confusion as to whether or not Richard had been excommunicated and the trial was adjourned until Friday April 8th. The church seems to have taken this break to actually follow through and excommunicate him. Richard shot back with the very unusual and highly inflammatory Writ of Praemunire. This writ which was first implemented by Richard II in 1306 is a based on the idea that no foreign power, either political or religious, i.e. the Pope in Rome, could encroach on, or limit the powers of the English King. 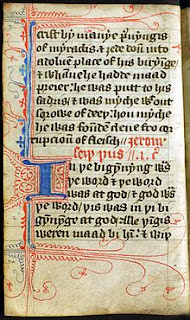 This is the same writ that Henry VIII would eventually use during his break with Rome. Richard Hunne's biggest obstacle in winning his case lay in the make up of the judges of the King's Bench. Many of them may have owed their loyalty or position to the Arch Bishop of Canterbury. If they found for the defendant, a Priest, they would be seemingly giving the church a higher power that the King. Their decision was to once again adjourn the case until Monday 13 November 1514. Meanwhile, Richard was arrested and charged with heresy and imprisoned in the Lollard's Tower at the Cathedral of St. Paul. Apparently he owned a bible, written in English. On 4 December 1514, he was found hanged in his cell. It was obvious to all that he had been murdered. 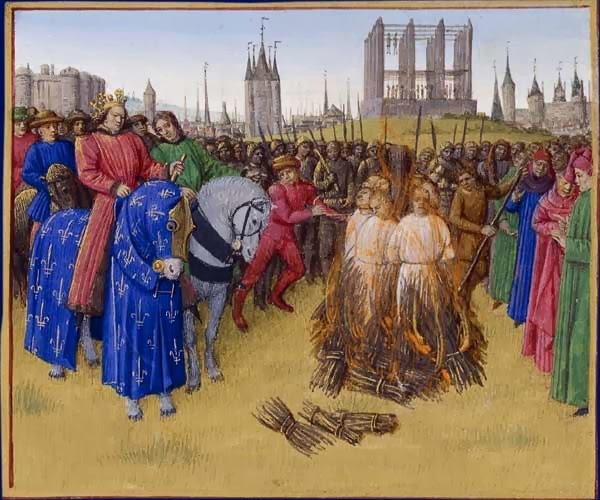 You would think that this would have been the end of it, but the church persued it's heresy case against Richard, trying his now dead body and finding it guilty. 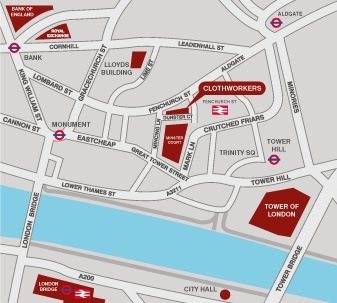 On 20 December Richard Hunne's body was burned at he stake at Smithfields. William Horsey, the chancellor to the Bishop of London, was eventually charged with the murder of Richard Hunne. He chose to be tried in the King's Court as opposed to the ecclesiastical court. Cardinal Thomas Wolsey asked the king, Henry VIII to intervene, which he did, and ordered his attorney to find Horsey innocent. Some seven years after Richard's death, King Henry reversed his opinion on the case and wrote to Horsey, saying he knew he was guilty and that he, Horsey would restore to the family of Richard Henne the value of his estate, which was quite large. Richard's sacrifice may not be known by many people, especially today, 500 hundred years later, and his death may not have had much of an impact on the religious changes that were coming, but I think it did have an impact on his future son in law, Adam Winthop, Jr. The very fact that he would marry the daughter of such a controversial figure, at least in his day, speaks volumes of the religious beliefs of Adam Winthrop. Why would he align himself with a heretical man if he did not share common thoughts and values. Was this the Winthop families' first step towards the radical decision to leave t England for a new land in which they would be free from all things Catholic, possibly. To read a more thorough account of Richard's case see this aritcle by W. R. Cooper. It is the best article I have found on the subject. This will probably be a fairly short post as there is not much known about Adam Winthrop, Sr. His parents are unknown, his date of birth and birthplace are unknown and his date of marriage is unknown. However, if you know anything about early American History then you know something of his great grandson, John Winthrop, Governor of the Massachusetts Bay Colony. I am not related directly to John Winthrop but rather to his uncle William Winthrop, grandson of Adam Winthrop, Sr. Still, it's pretty cool to have the Winthrop's in my family tree. What we know of Adam's story begins with his son, Adam, Jr. who was baptized in October of 1498 at the church of St. Peter and St. Paul in Lavenham, Suffolk, England. The discovery of America in 1492 was still a new and exciting thing, a novelty for most who heard the news. King Henry VII, father of the famous Henry VIII, was still on the throne and Catholicism was the dominant religion, period. A new land, a new king and a new religion would have a lasting impact on the Winthrop family. Adam and his wife, Jane Burton, had at least one child, Adam Jr., no other children either survived or were recorded, if they existed. Adam Sr. died sometime during the childhood of his son. Jane Burton Winthrop, his widow, remarried to another Lavenham man. He was John Ponder, and like her first husband he was a clothier, only more successful. Cloth manufacturing was the driving industry in Lavenham and the surrounding area in the county of Suffolk. 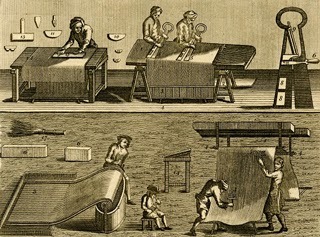 The year 1500 was probably close to the height of prosperity for the wool-cloth industry. Young Adam Jr. was in the right place at the right time and he made the most of it. Not much is known about Joseph Hibbart who, with his twin brother Robert, was born in May of 1648 in Salem, MA. His father, Robert, had immigrated from England in the early days of the Colony, working for John Winthrop Jr. at his salt house. His mother's name was Joan, her last name is unknown. The area in Salem where Joseph's family lived separated from Salem and became known as Beverly, he spent his whole life there. It is written in several reference books that on 20 Oct 1670 Joseph married Elizabeth Graves, his brother John married Abigail Graves, possibly her sister on the same day. I have also read that Joseph married Abigail Elizabeth Graves. The official record, Salem Town Records, is confusing as it was written by several different people with different handwriting at different times and apparently an error(s) was made when recording the marriage and other information. The record says that Joseph married Abigail Graves, but it is believed that Abigail was the first wife of John, he then married Ruth Walden in 1679. The best answer is I don't know. The net offers several choices of father but I don't think any of them are correct. Choice one is Richard Graves and his wife Dorothy. They had a daughter Elizabeth born c. 1645, however she was dead by 1661 which sorta rules her out. Choice two is Thomas Graves and Sarah Whiting, unfortunately their daughter Elizabeth was born in 1625, to old for our Elizabeth. It is possible that her surname was not even Graves and that the recorder totally messed things up. Rebecca b. 11 July 1692, m.
most of the children are recorded as having been baptized in 1692, was this the result of the ongoing witch trials? Not much more is known about Joseph and Elizabeth. Joseph died 14 May 1701 age 53. His will was filed on 30 June. Elizabeth was still alive at that time, her death, if recorded, is not known. In 1721 the surviving heirs of Robert Hibbart released their rights to his land, they were: Dorcas, Bridget, Elizabeth (Haskell) and Jeremiah. As his wife Elizabeth was not listed I presume that she had died by that date and it is possible that it was her death that brought about the sale of the land. Well after a brief look at the genealogical evidence for Robert Hibbart and his wife, said to be Joan Cluff, I can see I have a lot of work to do to get this one correct. One of the first things I noticed is the many spellings of the name Hibbard: Hebert, Hibbert, Hibberd, Hibird, Hibbard, Hibbart are just some of the variations of the name. In the signature above, Robert himself spells is surname Hubard. For this blog I am going to spell it Hibbart when I write about him. If I am writing from another source I will spell it the way they did. I know that there are multiple Hibbart family websites and a Hibbard book but they just might have some of their info wrong. The identity of Robert's wife Joan is also under scrutiny. So, who were Robert and Joan Hibbart, let's get started. In Sidney's History of Salem, MA he writes a Robert Heberd lived in the salt works built and owned by John Winthrop Jr., son of Governor Winthrop, in about 1638 or 1639. Sidney says Robert Heberd was about 23 years old and was born about 1615. Other than the estimated year of birth and the fact that Robert was almost certainly born in England he offers no information concerning the birthplace of Robert. So a search of ancestry.com and other websites shows that most believe that Robert was born in Salisbury, England, and baptized on 13 March 1613. This information comes from the book, Genealogy of the Hibbard Family who are Descendants of Robert Hibbard of Salem, MA by Augustine George Hibbard. The author states that Robert the immigrant was baptized on that date in Salisbury, but offers no reason why he believes it to be so. Well there was a Robert, son of John, who was baptized on that date, but how do we know that he was the same Robert who immigrated to the Massachusetts Bay Colony? There are no records which would prove the year of immigration for Robert, but he was definitely in Salem by 1639. A Robert Hebert is recorded as being in Salem in 1639 in the employment of John Winthrop Jr. in the business of making salt, a very important industry in the early days of the colony for preservation of fish that were caught and sent back to England. He is also described as a bricklayer. Robert and his wife Joan were admitted as full members of the church in Salem on May 3, 1646. They had their children baptized after their admittance. Their oldest surviving child was Marie who was born on November 27, 1641. Robert and Joan must have been married by the end of 1640 or beginning of 1641 if Marie was their first child, their marriage is not recorded in Salem and it is entirely possible that they were married in England prior to their departure. Because Robert was a full church member he was able to take the freeman's oath, which he did 6 July 1647. In 1659 he bought 13 acres of land from a William Hascall, he is called Robert Hibbard, bricklayer in the deed. On 12 August 1650 the selectmen of Salem granted Robert Hiberd 20 acres of ground to be used for commonage and wood, this land was on across the river from Salem proper. In March of 1665/6 he was granted more land on the Cape Ann side and across the Bass River from the Salem. This area was set apart from Salem and became known as Beverly. I have read that Robert moved to Beverly but I think that the land he lived on became Beverly when it was incorporated as a separate town. Joan is said by many on the net and ancestry.com to be the daughter of John Luff and his wife Bridget of Salem. In the records of the Court and of the town of Salem, John Luff is called "father" by Robert Hibbart. This inferred relationship has been interpreted as meaning that John Luff was Joan's father and Robert's father in law. However, Robert Charles Anderson of the Great Migration Series disputes this relationship in his bio on John Luff. John Luff sailed from England on the Mary and John in March of 1633/4, no other family members were listed. 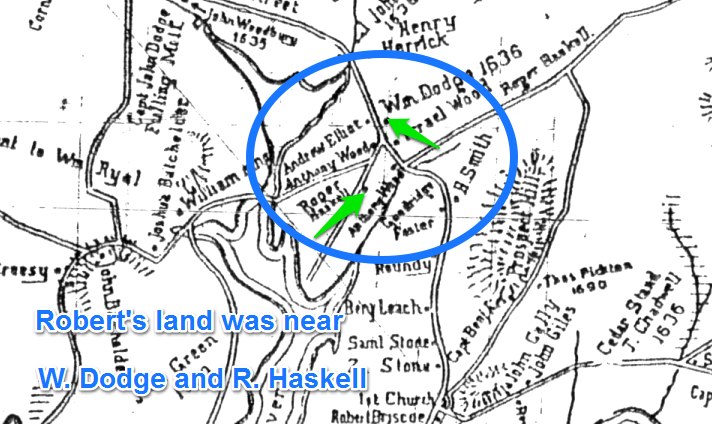 John received land in the 1636 division of land in Salem, the amount of acreage was not listed. Significantly, in the records of the 1637 division, each recipient's name was recorded along with the size of their household. The acreage of each man's allotment was dependent on the size of his household. In 1637 John Luff had a household of one, no wife and no children. Anderson surmises that John Luff married Bridget Unknown between 1637 and 1647, after the land grant of 1637 was made. He believes that Bridget was either the mother of Robert Hibbart or of his wife Joan, making John Luff the step-father of one of the two. I tend to agree with Anderson so my Joan will be Joan Unknown. Joan was presented at least twice in the Quarterly Court held at Salem. In November of 1659 she was appeared and was accused of railing and speaking several lies upon Zackary Herek. It was said by witnesses that she claimed that she saw Zackary leaving the house of John Ston. She, it was claimed, said he was drunk. She denied ever saying such thing and swore as God is her witness that she did not. The court apparently did not believe her and offered her a choice of being fined or acknowledge her lies, she chose the fine. Jane was again in court for saying that Liddea and Mary Grover (who I think was married to Zachary Herick) were "the veriest lyers att Bass River and they were able to ly the devill out of hell". She confessed that she said it and that it was the truth, she paid a fine. Joseph, bp. May 7, 1648, m. Elizabeth Graves, their daughter Dorcas married Nathaniel Abbott of Andover their daughter Mary Abbott m. Benjamin Blanchard. Chloe Blanchard their descendant married Samuel Thornton. 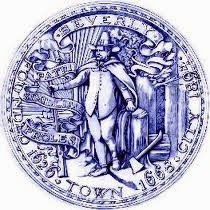 Robert died in Beverly on 7 May 1684. Although he had signed his name on documents when he was younger he was unable to sign his will which was written on 9 April, barely more than a month before he died. Joan lived another 12 years, dying in Beverly in 1696. Robert died before the Salem Witch trials but Joan and their children would have had front row seats as the drama unfolded. I do not think that they were involved in any of the trials but surely they would have known accusers and victims of the trials. Bridget Luff lived with Robert and Joan until she died sometime after June of 1671, when she was in court testifying. 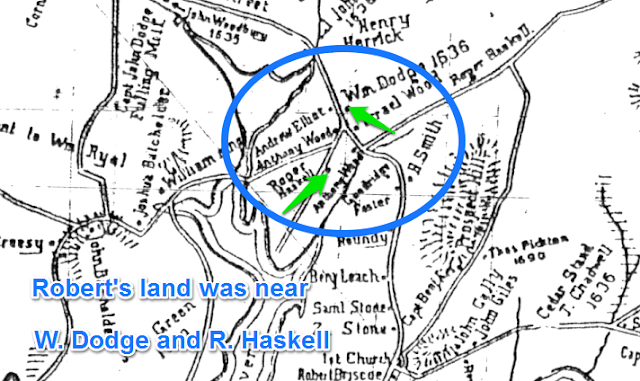 This blog post comes hard on the heels of one written about George Abbott who also hailed from Bishop's Stortford, in fact it is believed that he traveled with the Chandler and Dane families to Roxbury in 1637. The English ancestry of both the Abbott and Chandler families has been well researched. The story of William in America is a short one, Annis however, lived a long life, outliving three husbands. As is typical of women of her time, her story can only be told through the records of her husbands and her children. Like the family of George Abbott, William Chandler's ancestry can be traced back to his gg grandfather Thomas Chandler. The family was well established in the Bishop's Stortford area where they were flourished. They were never rich but they seemed to be successful. Thomas Chandler, gg grandfather of William was first documented in Bishop's Storford in 1514 when the burial of his wife was recorded in the parish records. His surname was spelled Chaundeler and it seems that he may have been in fact a "chandler" by occupation; a candle maker. William the immigrant's father was Henry Chandler who was born around 1560, married wife Anne Unknown by 1590 and wrote his will and died in 1618. He was a Glover by trade, but by then the surname no longer represented the occupation of the individual. William was a "pointer" he made the tips of laces for clothing, shoes and boots. Hard to believe you could have made a living at that but there you are. William married twice in England. His first wife was Alice Thorogood of nearby Farnham, they married 29 January 1621/2. They had two children, both girls, who died early. Alice died in June of 1625. William wasted no time and was remarried on 6 November 1625 to Annis Bayford, also of Farnham. Annis, whose name is also given as Anne and Agnes was the daughter of Francis and Johan Bayford. 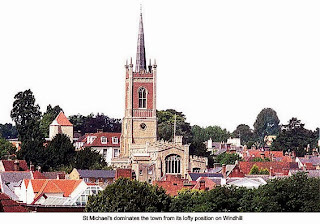 She was baptized in Farnham on 12 June 1603. In 1637 he and his wife and four small children, along with quite a few of their neighbors, left their homes in England behind forever for a new life in New England. Although his wife and children would prosper in their new home, William was dead within four years of his arrival. 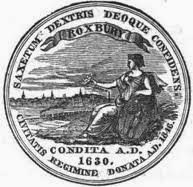 William and his family as well as other families from the Bishop's Stortford area made Roxbury their initial home. He was given a house lot and some land, totaling 22 acres for farming. His oldest son Thomas was still a boy of nine years of age so would not yet be strong enough to help with the laborious task of clearing and plowing virgin land. George Abbott, a young man also from Bishop's Stortford who would one day marry the then seven year old Hannah Chandler, was believed to have traveled with and been living with the Chandler family. If so, he would have been a strong pair of hands to help the 42 year old William. William took the freedman's oath on 13 May 1640. In order to do so, William had to be a full member of the church at Roxbury. Being a freedman would enable a man to participate fully in the running of the new colony but by 1640 William was dying. He suffered from a lingering illness which lasted the better part of a year, as recorded by the Reverend John Eliot, minister of Roxbury. He wrote that William "fell into a consumption to which he had been long inclined, he lay near a year sick". He described William as poor but God opened the hearts of his nabs (neighbors?) to him, yet he never wanted". His death was recorded on the 26th of the 11th month of the year 1641. This is often interpreted as 26 November 1641, but if Rev. Eliot was referring to the 11th month of the Puritan calendar than the date is actually 26 Jan 1641/2. The Puritan calendar year began on March 25th not January 1. 7. Sarah b. Roxbury m. William Cleaves, m. ? Wilson, m. Ephraim Stevens, m. ? Allen d. unknown probably in Andover. On 2 July 1643 Annis married widower John Dane. He too hailed from Bishop's Stortford. John assumed responsibility for raising and maintaining her children for which he was awarded the house and land originally granted to William Chandler. Annis' son William married John Dane's daughter Mary and her daughter Hannah married his son Francis, quite a combining of the two families. John Dane was born about 1587 in Little Berkhampstead, he had married and had children in England which he brought with him to New England. His wife died the same year as William Chandler. John and Annis were married for 15 years before he died in Roxbury in 1658. He divided his estate amongst his children and his "loving wiff". Annis married for a third and last time on 9 August 1660 to John Parmenter, widower, deacon of the church, and resident of Sudbury. His wife had died the previous April. He died, aged 83, in 1671 in Roxbury. Annis lived another 12 years, dying in March of 1683. She was recorded as "old mother Parmiter, a blessed saint". Someone on ancestry.com has William Chandler as Sir William Le Chaundler and his wife Annis is called Lady Annis. In this same tree George Abbott who married their daughter Hannah is called Sir George Abbott and they include a portrait of him. While this is good for a giggle, it is pure fabrication. The portrait is actually of George Abbott who was at one time the Archbishop of Canterbury, he died in 1633. Moriarty, G. Andrews, "Ancestry of George Abbott of Andover, Mass.," New England Historical and Genealogical Register 85, 1931, 79. Moriarty, G. Andrews, "Ancestry of William Chandler of Roxbury, Mass.," New England Historical and Genealogical Register 85, 1931, 133 -. Share book reviews and ratings with Jean, and even join a book club on Goodreads. This blog is funded by commissions from Amazon. Please consider making your next purchase through this site. Thank you for stopping by and reading this article. You can also help by purchasing a copy of my book available at Amazon. Thank You! Did my research help? Please consider a small donation to keep this site going. This blog is partially funded by commissions from Amazon. Please consider using this site to enter Amazon for your next purchase. Thanks for reading my blog. All text Copyright by Jeanie Roberts. Awesome Inc. theme. Powered by Blogger.